These hearty bean burgers are packed with tasty goodness. They’re the perfect veggie option for summer barbecues and are a great base to add tasty toppings to, like halloumi cheese, mediterranean roasted vegetables and salad. Summer has finally arrived; the weather has been absolutely scorching this week, so inevitably the London air has been taken over by the wonderful smell of barbecue smoke. I’ve been craving burgers, salads and some fizzy cider to wash it all down with. I’ve been trying to make an effort to buy in season produce of late, so the inspiration for making these burgers came from broad beans being grown on home soil. The broad beans bring a nice firm texture to the burger, whereas the butter beans balance things out with their softness. The onion, herbs and marmite work together well to add subtle, earthy flavours and the oats and egg bind the patties together for a classic shape. This recipe makes four burgers. You could have two in buns with salad for a filling main course, or one each as part of a BBQ with other vegetarian options like vegetable kebabs and sausages. 1. Heat the tablespoon of oil in a large frying pan and add the onion, garlic and thyme. Cook over a low heat for 10 minutes, stirring regularly. 2. Bring a small pan of salted water to the boil, add the broad beans and butter beans, and cook for three minutes, then drain in a colander. 3. Tip the beans and the onion mixture into a large bowl, add the parsley and marmite, season well and stir everything together. Use a hand blender to mash the ingredients up until they form a thick, smooth paste. 4. Add the oats and egg to the bowl and stir in with a wooden spoon. Leave the mixture for 10-15 minutes, so the oats can soak up the egg. 5. At this point, I started to prep my sides, like some homemade guacamole and halloumi cheese. Depending on what you want to serve the burgers with, you can use this time to get other bits ready. 6. Here comes the fun bit. Using your hands, divide the mixture up into four mounds, and shape each one into a round burger shape. 7. Using your frying pan from earlier, pour in a further tablespoon of olive oil and put on a medium heat. 8. Add each of the burgers to the pan and squash them down with a fish slice, so they’re a decent size and not too thick. Fry them for five to seven minutes on each side, or until they brown up. 9. Serve in wholemeal buns with fresh salad and sauces of your choice. I always recommend having cheese on a burger, and halloumi goes really well with these. You might also like to add some roasted pepper and onion. The more toppings, the better! 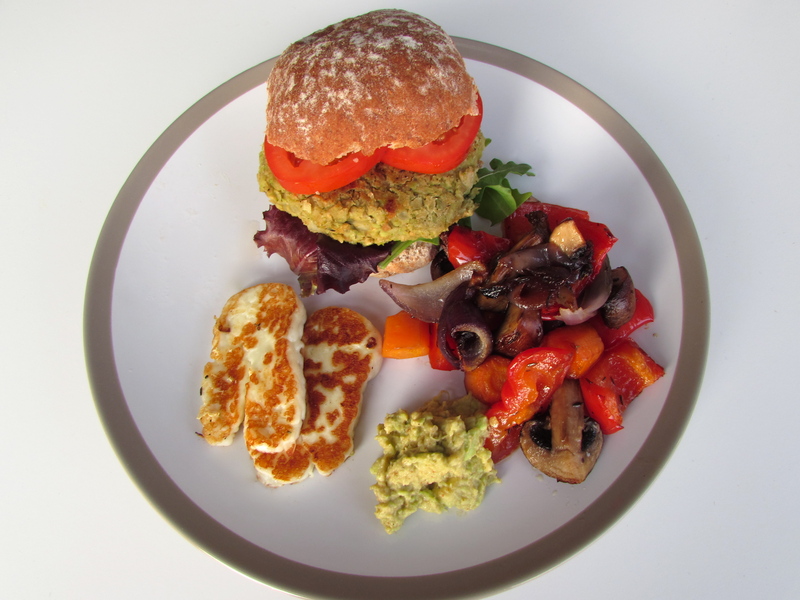 This recipe is based on Pat’s Broad Bean Burgers recipe from one of my favourite veggie cookbooks, Leon Fast Vegetarian.